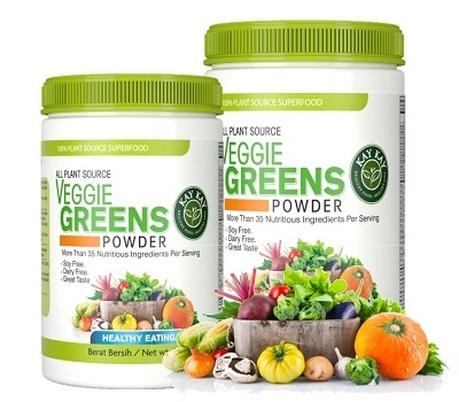 ​KAY KAY™​ Healthy Food, Healthy Life All PLANT SOURCE VeggieGREENS POWDER is a NON-SOY based powder formula that is packed with over 35 nutrient-rich superfood, vitamins & minerals and a great way to get a healthy & nutritious drink in a simple and convenient way. Each serving of 10g contains a combination of plant-based herbs, vegetable blend, vitamins & minerals, Oat, Prebiotics, Kale powder & Chlorophyll. It’s superfood simplified! Abundance of colourful vegetables and greens are rich source of antioxidants and phytonutrients for your glowing health and wellness. Oat is a good source of fibre and inulin (prebiotic) encourage the growth of friendly bacteria for your gastrointestinal health. Superfood for the entire family. Enjoy every sip of the goodness for a healthier you. Non addictive. No added sugar. Lactose free. Non soy. Non dairy. No artificial flavors and no preservatives. Cholesterol free and low fat (less than 1 g per serving). Kale, Carrot, Red beet, Mushroom, Broccoli, Cauliflower, Green cabbage, Celeriac, Leek, Onion, Cucumber, Asparagus, Red bell pepper and Garlic. ​Liu R.H. (2003) Health Benefits of Fruits and Vegetables are from Additive and Synergistic Combination of Phytochemicals. American Journal of Clinical Nutrition. Vol. Pp 517-27. Chidananda, K. & Jagadeesh, K. (2015) Phytonutrients: Add Colors To Diet For Better Health. Asian Journal of Pharmaceutical Technology & Innovation. 03(10). Cruciferous Vegetable and Cancer Prevention (2016) National Cancer Institute. Zhang, X. et. al. (2011) Cruciferous vegetable consumption is associated with a reduced risk of total and cardiovascular disease mortality. Am J Clin Nutr. 94(1): 240-246.
the growth of bifidobacteria in human. Nutrition Research. 27(4): 187-193.